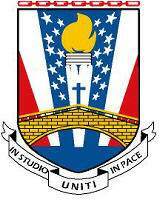 Im November 1953 wurde die 7330th Training Wing in fursty aufgestellt. Ihre Aufgabe war die Aus- und Weiterbildung der angehenden Luftfahrzeugführer innerhalb des MDAP (Mutual Assistance Pact) Programms. Dies waren Nationen die Betreiber der Lockheed T-33 Trainers waren. Um den Fliegerhorst Fürstenfeldbruck zu betreiben und zu unterhalten waren Logistik- und Verwaltungseinheiten notwendig, sie bereiteten die Stationierung und die notwendigen Massnahmen vor, um die taktischen Einheiten zu unterstützen, die fursty als Ausgangsbasis nutzten. 1957 wurde der Fliegerhorst noch gemeinsam durch Amerika und Deutschland genutzt, bis die "7330th FTW" umgewandelt wurde in die "7367th Fighter Training Group", diese wurde 1960 aufgelöst. Das erste US-Acro-Demoteam waren die "Acrojets" diese hatten ihre Vorführunegn schon 1949 mit der F-80C als Flugzeugmuster an der Williams AFB, in der Nähe von Higley, Arizona durchgeführt. Dieses Team blieb bis zu zum August 1950 aktiv, als es wegen des Ausbruches des Korea-Krieges aufgelöst wurde. 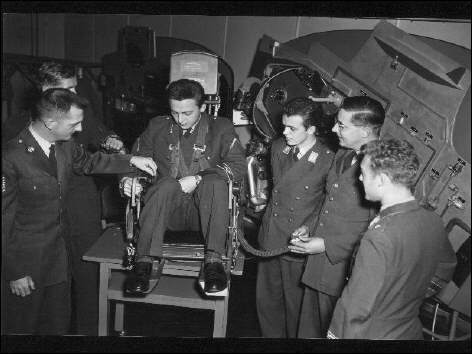 Später gab es wieder ein "Acrojet" Team als die amerikanischen Fluglehrer auf der T-33 in fursty die Ausbildung von angehenden Jet-Flugzeugführern durchführten. HOUSTON — Maj. Robert H. Lawrence, America’s first black astronaut, had already traveled far by the time he was selected as a military astronaut in 1967. His death later that year in a tragic accident not only cut short a promising career, it led full recognition of his accomplishments and hard-won status to be obscured for decades. Only after his supporters traveled their own difficult journey was Lawrence accorded his proper place in space history. Lawrence was a 31-year-old Air Force officer when he was selected in 1967 to join a small team of military officers training for a planned small space station. The Pentagon's "Manned Orbiting Laboratory," or MOL, was intended to explore the value of military space missions for astronauts. Two-man crews would be launched aboard advanced Gemini capsules and spend a month or more in orbit, practicing visual reconnaissance and communications intercepts and other national security tasks. NASA astronauts had already made ten orbital flights aboard Gemini spacecraft, and had just begun the Apollo program and its race to the moon. But the 1960s space race wasn’t just about peaceful exploration, and both the Soviet Union and the United States were also developing manned space systems for military purposes. Just two years later, however, the MOL project was canceled as its costs soared and as unmanned military satellites became more sophisticated. The astronaut team was disbanded, some returning to their parent services and the youngest ones transferring to NASA. Had Bob Lawrence lived, he likely would have been among the group sent to NASA, all of whom later flew in the space shuttle program. 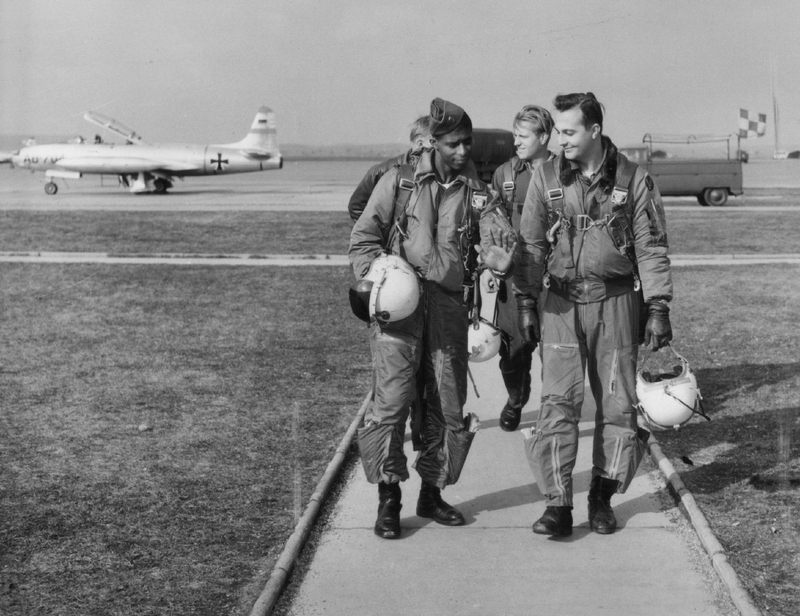 Instead, Lawrence's death in a Dec. 8, 1967 jet crash made him the only member of the MOL team to lose his life in the line of duty on that program. The crash itself soon became entwined with garbled stories and widespread misunderstanding. Sometimes called a "training flight" or a "space shuttle landing test," the true nature of the flight -– and the enormity of the loss -– remained elusive for decades, and this contributed to Lawrence’s remaining the "unsung astronaut." In 1971, Apollo 15 astronauts left a memorial plaque on the moon that named fourteen American and Russian names. Lawrence was not included. When, in the wake of the Challenger shuttle disaster in 1986, a private foundation built a memorial at the Kennedy Space Center in Florida, Lawrence’s name was again omitted. If in the end the difficulties turned out to have been more connected with the color of his uniform -- Air Force blue -– than of his skin, the fact remains that Lawrence's legacy was allowed to go unheralded for decades. Lawrence was born and raised in Chicago, where he excelled in school. At Bradley University he obtained a degree in chemistry and signed up for ROTC, where he became the corps commander. He graduated in 1956 and received an Air Force lieutenant’s commission. After completing flight training at Malden AFB, he was assigned as an instructor pilot for the German air force, flying T-33 trainers at Furstenfeldbruck AFB near Munich. He then was assigned to Ohio State University to earn a PhD in physical chemistry, completing his thesis in 1965. Lawrence remained an active jet pilot while performing research at Kirtland AFB in Albuquerque, New Mexico, and eventually accumulated more than 2500 hours of flight time, 80 percent of that in jets. Much of that flying was done at Edwards AFB in California in early 1967, where he graduated from the Air Force Test Pilot Training School. On June 10, Lawrence was officially designated a crewmember candidate for the Manned Orbiting Laboratory project, as part of the third selection of astronauts. He and his teammates remained at Edwards AFB performing various research and training tasks. Throughout the 1960s, both NASA and the Air Force were experimenting with small-winged (such as the X-15) and even no-winged flying craft („lifting bodies“) that were seen as prototypes and test beds for future manned space vehicles. The key to making a successful runway landing was in performing a risky high speed maneuver just prior to touchdown. Called a "flare," the maneuver involved pulling the craft’s nose up to generate a short burst of extra lift (slowing the descent) by sacrificing a lot of forward speed (reducing touchdown speed). Timing was critical, and the aerodynamics were still being mapped out. Too soon, and you began falling again, too fast; too late, and you never slowed enough to survive runway contact. One operational vehicle that could be used inexpensively to "explore the envelope" of such approaches was the F-104 Starfighter, with its stubby wings. By reducing the jet's flyability through extra air drag, reducing its engine thrust and flying a hazardous nose-high approach, it could be made to fly almost as unstably as the experimental craft did. Lawrence had mastered this piloting task and made a number of test flights in a special two-seat version of the jet. 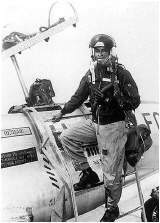 On Dec. 8, 1967, he was the instructor pilot for another officer, Maj. John Royer, who was learning how to perform such maneuvers himself. During one approach, the jet, with Royer at the controls, hit the runway hard, collapsing its landing gear and setting the undercarriage on fire. As detailed in the official accident report, the aircraft briefly became airborne again, then came back down on the runway and began rolling. Both pilots ejected as it rolled, with Royer sent slightly upward and Lawrence, whose ejection seat had a slight timing delay to avoid contact with the first seat, sent to the side. Royer was severely injured; Lawrence fatally so. In later years, a series of high-performance vehicles used this same kind of "flare" to land at runways after high-altitude missions and even space missions. Seven of Lawrence’s fellow astronauts in the MOL program made space flights aboard NASA shuttle vehicles that landed this way. These seven men were accepted into the NASA program in mid-1969, under an agreement that allowed the youngest -– those likely to be around for the long years of additional training –- to transfer. Lawrence’s date of birth put him squarely into the range of those accepted, and there’s no question that he would have been part of the transfer. In retrospect, people who knew him have wondered what sort of space flight career he would have had. Lawrence's MOL colleagues flew in the shuttle, walked in space, commanded Spacelab science missions, and later assumed high positions within the space program. They took command of NASA space centers, space industry divisions -- one even became NASA Administrator. Another MOL colleague, too old by only a few months for the transfer to NASA, became director of the Strategic Defense Initiative missile shield program in the 1980s. Lawrence’s skills would have made all of those achievements –- and more –- within his range. But instead, throughout the 1970s and 1980s, Lawrence's memory languished in obscurity, at best a footnote in historical reports and archives. His family, friends and his hometown of Chicago had not forgotten him, but since he had never been a "NASA astronaut," he wasn’t on the minds of most space experts -- many of whom had forgotten that there ever had been any non-NASA manned space programs. Lawrence's parent service, the Air Force, did not help. Although NASA considers a person an "astronaut" as soon as he or she finishes a yearlong training program, the Pentagon has an entirely different criterion for awarding recognition: to them, an "astronaut" is only somebody who has actually flown to an altitude of above 50 miles. Perhaps that explains why the Apollo 15 memorial plaque, does not carry Lawrence’s name -– even though all three crewmen on that mission were also Air Force officers. Russian names were listed on the plaque, as was a man killed in an off-duty traffic accident and several NASA astronauts who had never flown above 50 miles. Lawrence, however, was ignored. The subsequent refusal by the Astronaut Memorial Foundation to include Lawrence’s name on the Florida memorial seems to have been directly traceable to a reply they received from the Pentagon when, prompted by advice from space historians, they asked about his status. Maj. Lawrence, the personnel clerk had replied, had never met the Air Force standard to be called an "astronaut". This bureaucratic pettiness -– and the Foundation’s all too convenient acceptance of it as the last word -– sparked a private campaign by historians, journalists and eventually politicians to overturn the obstructionist and over-literal decree. Once high-level officials in the Pentagon saw the strength of the campaign and the depth of the bitterness at the appearance of racist motivations, the Air Force adjusted its criteria to be consistent with NASA’s and deemed Lawrence worthy of recognition on the memorial. On Dec. 8, 1997, on the thirtieth anniversary of his death, Lawrence had his name unveiled on the Florida memorial. And last month, on NASA's first annual "Day of Commemoration," astronaut Fred Gregory -- now acting administrator of NASA, the first African-American to have such a high post at NASA -- paid special tribute to Lawrence. It was the first time that a NASA official had explicitly drawn attention to his status. Lawrence had already fully earned these honors, the memorial and recent tribute merely recognized, belatedly, that historical fact. James Oberg, space analyst for NBC News, spent 22 years at the Johnson Space Center as a Mission Control operator and an orbital designer. He was among those who campaigned for Lawrence's recognition.